The Flash Wolves pair has become the most iconic mid-jungle duo in the world. An army of passionate League of Legends fans crowded into the cozy confines of the Dock Pullman amphitheater in October 2015. It was a beautiful fall day in Paris, but they planned to stay inside for hours to see the best teams in the world duke it out in the group stage of the Season 5 World Championship. Some of the biggest names in League were there: Lee “Faker” Sang-hyeok and Season 3 champions SK Telecom T1, their nemesis EDward Gaming of China, and the undefeated Fnatic side from Europe. One team that flew far under the radar? The Flash Wolves of the LMS. Led by mid laner Huang “Maple” Yi-tang and rookie jungler Hung “Karsa” Hua-hsuan, the Taiwanese team wasn’t expected to go far. The organization had scarcely made a blip in international appearances and were virtual unknowns heading into Paris. But then, something strange happened. The team started winning, driven by the efforts of their two proto-stars. A ridiculous 12/1/8 LeBlanc game from Maple clinched the unthinkable: first place in the group. Maple and Karsa had dominated League as one of the best mid/jungle duos ever since. This is their story. It’s ironic that Maple is considered a veteran player, someone who’s carried the torch for so long. After all, he’s still a teenager. He won’t turn 20 until after this season’s World Championship is underway. Karsa too, was a teenager until just a few months ago. A look back at the two player’s careers is a study in contradictions. Recently, they’ve been nearly unbeatable in domestic play. But when Karsa joined the team in the inaugural LMS season in early 2015, things didn’t always turn up aces. Despite strong regular season play, the Flash Wolves could not stop AHQ from racking up two straight playoff titles. The team did have success in its first international tournament together, at IEM Championship in Katowice. They took down CLG and SK Gaming in upsets and even grabbed a game off an oppressive TSM side before losing. It was an impressive showing, but their inability to win the LMS did not make them favorites to get out of the 2015 World Championship. At Worlds, the team’s first game against CLG was a mess. Karsa was excellent, picking up kills for his team all over the map and grabbing the first Baron. But in what has become a hauntingly familiar script, Flash Wolves threw in the late game by falling to the enemy ADC. In this case, it was veteran carry Yiliang “Doublelift” Peng who showed them how mortal they were. Their next game, against the Koo Tigers of the LCK, could have been a funeral. Koo ultimately made the final, after all. But Flash Wolves found a way to win behind perfect games from Maple and Karsa. It was a huge moment for the duo, proving that they belonged in Paris among the world’s elite. For the team, the winning kept going. After splitting two games with the wildcard team, Flash Wolves took it to CLG in the revenge match, with Maple going 5/1/10 on LeBlanc to seal the victory. But it wasn’t just Maple. ADC Hsiung “NL” Wen-an got going on an early kill and top laner Chou “Steak” Lu-hsi was excellent. Maple’s next LeBlanc game would be even crazier. Facing Koo again, Steak fell behind early in a tough matchup against Song “Smeb” Kyung-ho. But that just allowed Maple to carry even harder. 12/1/8 on LeBlanc is the definition of a hard carry. That win gave the Flash Wolves first place in the group and reset expectations for them going into the knockout round. But that’s when their run ended. In another contradiction, just as they seemed to get going, they were nearly swept. Their opponents in the quarterfinals that year was Europe’s Origen, led by mid laner Enrique “xPeke” Martinez. Maple actually had a great series, accumulating a monstrous 18/5/15 slash line. But xPeke was better. xPeke picked Anivia three times in that series, and Origen won all three games. He made Maple’s life hell through his constant control of the mid lane, preventing his opponent from leaving and helping the side lanes. Anyone who’s played against the frustrating control and wave clear from Anivia can understand just how frustrating it can be. This same story would continue over the next few years. Flash Wolves would always show up against the LCK teams, especially three-time World Champion SK Telecom T1. And they would fall flat against everyone else. Their Kryptonite was anyone outside the LMS and LCK regions. First it was another 1-3 loss to CLG in the 2016 MSI semifinals. Then there was the disaster of the group stage at last year’s Worlds, where they lost two straight games to IMay and Cloud9, and never recovered, despite another daring win against SKT. The Cloud9 game was particularly catastrophic. Despite Karsa making C9 jungler William “Meteos” Hartman look silly for most of the game (and at one point, Flash Wolves had all three inhibitors down). And still they couldn’t break through. The game got late enough that a single teamfight would be decisive for either team, Meteos came through with a clutch Lee Sin kick, one of the only ones he hit all game, and it was curtains for Flash Wolves once again. Even the game script remained virtually the same. In almost all of those losses, Karsa controlled the early game around Maple’s lane and helped build big leads. But no lead seemed safe for a side that looked as if they didn’t know how to finish. No matter how hard Maple and Karsa carried, they’d find a way to lose. Describing the team’s comeback in the 2015 World Championship, Maple said “we tried another strategy of emphasizing jungle and mid synergy, an older LMS meta, to get me snowballed.” Problem was, everyone else caught up. 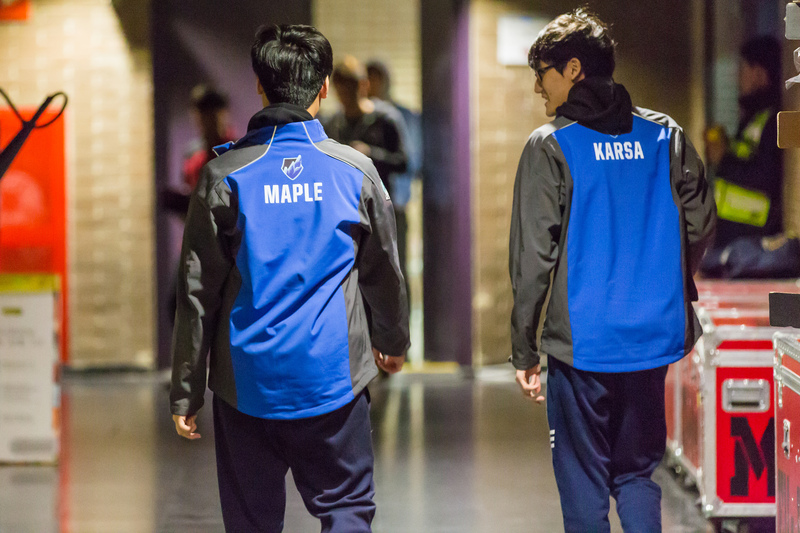 With an uncertain offseason ahead of them, that was nearly the end of the Maple and Karsa incarnation of the Flash Wolves. Speculation that the team would break up after 2016 wasn’t unfounded. In fact, Karsa spoke about going international in 2017. Maybe the team’s inability to win at international events was a sign that change was needed. Maybe Maple and Karsa grew tired of getting let down by their side lanes, playing two-on-eight League. The team had really only been together for two years, but that’s an eternity in esports. They had tried all sorts of strategies and champions to get their first international title, all to no avail. If anything, all the changes just proved one thing: how strong Maple and Karsa are, and how much help the team needs everywhere else. In interviews over the years, the two have consistently given realistic answers for how good—or bad—Flash Wolves are, revealing a possible lack of confidence in themselves and their team. It’s amazing to take a look back at Maple’s champion pool. Season 5 was all about the assassins—that LeBlanc that was so deadly, but also Ahri and Zed. In Season 6, he weaved in more mages like Ryze and Vladimir. But you can see evidence at mud being thrown at the wall: the team had six games at Season 6 Worlds and Maple played six champions. Perhaps what these two lack most isn’t better laners around them, but an identity. It was a surprise then when the Flash Wolves announced last offseason that they were bringing everyone back, including their mid-jungle duo. NL would step back from the starting lineup in favor of Lu “Betty” Yu-hung, the latest in a series of maneuvers designed to stabilize the side lanes. And despite a rough start, including another loss at IEM, this time to Europe’s Unicorns of Love, the team started to piece together an identity. Maple’s champion pool still looks more like an ocean, especially against inferior LMS teams, but at recent international events, he’s settled on a steady diet of scaling mages like Ryze and Syndra. And the team has learned to play around his pressure much better, particularly in vision control of the river. Over the years, the team has evolved from one of the worst-warding teams in the LMS into one of the best. The team has learned how to keep its early game leads. That development led directly to their first international success at the 2017 IEM World Championships. Facing another European squad in the finals, they used superior ward control of the river to wrest control of key neutral objectives. It’s become familiar to see all five Flash Wolves players carry control wards in inventory, ready to work as a team to dominate vision. After coming back in the first game, it was G2 that looked tilted, losing quickly to Maple’s unceasing pressure and handing Flash Wolves the breakthrough they were looking for. Like many young professional players, Maple, Karsa, and the Flash Wolves have grown up before our eyes. They’ve been on quite a journey, and it’s a delight for fans that it’s still going. In the past, they may have wondered at teams around them, teams with less talent at their positions and yet still win. Now, they are a rare team with a title under their belt. Even though that title came at IEM, a second-tier tournament in the realm of professional League, it is significant. It’s a sign that they’ve made it. It’s a testament to the consistent success Flash Wolves have had over the last two-plus years. After all, Origen no longer exists as an LCS team. EDward Gaming has fallen from its height. They swept the Unicorns on the way to that final. The fact that every few months Flash Wolves can be counted on to be relevant in an international event means something. And any international title is especially meaningful in the era of Faker’s dominance. It’s hard to imagine any team really challenging SKT, but if anyone has given them a run for their money, it’s the Flash Wolves. For the second straight Riot-sponsored international, this year’s Mid-Season Invitational, Flash Wolves again became the first team to take a game off the Korean overlords. And they did it by controlling the jungle and having Maple one-shot people. It’s anyone’s guess how long this run with Maple and Karsa will last. The team still has some of its old issues. It’s unlikely they can really take down SKT in a potential final, and it’s not even clear they’ll make that final. At the end of the season, the duo will have been together for three years. But hopefully, Maple and Karsa don’t have to wonder about the future anymore. Ideally, they won’t have to look elsewhere for a chance at success, because they’ve already succeeded. They are adored by fans all over the world as two of the most iconic players in League. With recent shakeups in SKT, they are the best mid-jungle duo around. Even as teenagers, Maple and Karsa have earned the right to live in the present with legacies already secured. So go ahead and enjoy the journey with them, Kryptonite be damned.